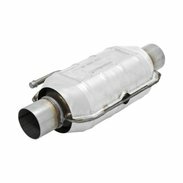 Flowmaster® Federal Catalytic Converters meet or exceed both OEM and USEPA standards and are intended for vehicles outside the state of California. 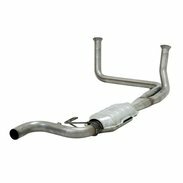 Federal catalytic converters may not be sold or used on vehicles that are licensed in the state of California. Fits Fit 1994 to 1999 Dodge Ram trucks including 1500, 2500 and 3500 with a 3.9L, 5.2L, or 5.9L engine. Fits 2000 to 2004 Toyota Tacoma with a 3.4L V6 engine. This is the rear unit. Fits 1988 to 1995 Toyota 4Runner with a 3.0L engine. Also fits 1988 to 1995 Toyota Pickup with a 2.4L or 3.0L engine. Fits 2004 to 2006 Ford F150 and 2006 Lincoln Mark LT with a 5.4L V8 engine Fits 4WD models only, Left/Driver side. Also fits 2004 Ford F-150 5.4L 4WD with the new body style, does not fit 2004 Heritage edition. Fits 2004 to 2006 Ford F150 and 2006 Lincoln Mark LT with a 5.4L V8 engine Fits 4WD models only, Right/Passenger side. Also fits 2004 Ford F-150 5.4L 4WD with the new body style, does not fit 2004 Heritage edition. Fits 2000 to 2006 Chevrolet and GMC C/K Pickup, and SUV with a 4.3L V6 engine, and 4.8L and 5.3L V8 engines. Fits 2000 Models WITH flat spot in OE middle pipe; see p/n 2010018 for models WITHOUT flat spot. Fits misc GM cars from 1982 to 1994 with V6 and V8 engines. Fits 2001 to 2004 Ford F150 with a 5.4L V8 engine. Fits 4WD models only. Right/Passenger side. 2004 fits old body style only. Fits 1988-1995 Ford F-150, F-250 and F-250 Super Duty with 5.8L V8 gas engine. Fits 1997 to 2000 Ford F-150 trucks and 1999 to 2000 Ford Expedition with 4WD and a 4.6L V8 engine. Left/Driver side only. Fits 1997 to 1998 Ford F-150 and F-250 including Super Duty models and Ford Expedition with a 5.4L V8 engine and 4WD. Left/Driver side only. Fits 2005 to 2009 Chrysler 300, 2006 to 2009 Dodge Charger RT and 2005 to 2007 Dodge Magnum RT with a 5.7L V8 engine. Left Side. Rear Wheel Drive models only. Fits 1997 to 2000 Ford F-150 trucks and 1999 to 2000 Ford Expedition with 4WD and a 4.6L V8 engine. Right/Passenger side only. Fits 2005 to 2009 Chrysler 300, 2006 to 2009 Dodge Charger RT and 2005 to 2007 Dodge Magnum RT with a 5.7L V8 engine. Right Side. Rear Wheel Drive models only. Fits 2007 to 2008 Chevrolet Silverado 1500 and GMC Sierra 1500 1/2 Ton trucks and Suburban, Avalanche, Tahoe and Yukon with a 4.3L, 4.8L, 5.3L or 6.0L engine. For general reference only - Fits 06-09 Chevy Impala/Monte Carlo - Reference application guide for true fitment. For general reference only - Fits 99-02 Daewoo Lanos/04-06 Chevy Ave - Reference application guide for true fitment. For general reference only - Fits 05-07 Buick/Chevy/Pontiac/Saturn - Reference application guide for true fitment. For general reference only - Fits 03-04 Saturn Ion - Reference application guide for true fitment. For general reference only - Fits 99-02 Chevy Cavalier/Pontiac Sunfire - Reference application guide for true fitment. For general reference only - Fits 97-04 Buick/Olds/Chevy/Pontiac - Reference application guide for true fitment. For general reference only - Fits 98-05 Cadillac/Oldsmobile - Reference application guide for true fitment. For general reference only - Fits 00-06 Ford/Mercury - Reference application guide for true fitment. For general reference only - Fits 00-02 Jaguar S-Type/00-05 Lincoln LS - Reference application guide for true fitment. For general reference only - Fits 02-05 Ford/Mercury - Reference application guide for true fitment. For general reference only - Fits 01-03 Ford Ranger/Mazda B-Models - Reference application guide for true fitment. For general reference only - Fits 05-09 Ford E-Series - Reference application guide for true fitment. For general reference only - Fits 05-07 Chrysler/Dodge - Reference application guide for true fitment. For general reference only - Fits 01-04 Chrysler/Dodge/Plymouth/T&C - Reference application guide for true fitment. For general reference only - Fits 01-10 Chrysler PT Cruiser - Reference application guide for true fitment. For general reference only - Fits 08-09 Dodge/Chrysler Caravan - Reference application guide for true fitment. For general reference only - Fits 04-06 Jeep Wrangler - Reference application guide for true fitment. For general reference only - Fits 00-04 Toyota Tacoma - Reference application guide for true fitment. Fits 2019 Ram 1500 Trucks with 5.7L Engine and Factory Dual Tailpipe Option. Does not fit 2019 Ram 1500 Classic. For general reference only - Fits 01-04 Toyota Sequoia - Reference application guide for true fitment. For general reference only - Fits 02-06 Camry/02-03 ES300 - Reference application guide for true fitment. For general reference only - Fits 98-02 Chevy/Toyota - Reference application guide for true fitment. For general reference only - Fits 00-05 Lexus GS300/01-05 IS300 - Reference application guide for true fitment. For general reference only - Fits 01-03 Toyota Rav4 - Reference application guide for true fitment. For general reference only - Fits 04-07 Lexus RX330/Toyota Highlander/Sienna - Reference application guide for true fitment. For general reference only - Fits 94-96 Toyota Camry - Reference application guide for true fitment. For general reference only - Fits 01-03 Toyota Sienna - Reference application guide for true fitment. For general reference only - Fits 04-06 Toyota Sienna - Reference application guide for true fitment. For general reference only - Fits 03-13 Honda Accord/Pilot/Ridgeline - Reference application guide for true fitment. For general reference only - Fits 97-01 Honda CRV/96-97 Odyssey - Reference application guide for true fitment. For general reference only - Fits 98-01 Nissan Altima - Reference application guide for true fitment. For general reference only - Fits 01-03 Infiniti QX4/Nissan Pathfinder - Reference application guide for true fitment. For general reference only - Fits 02-06 Nissan Altima/Sentra - Reference application guide for true fitment. For general reference only - Fits 03-06 Nissan Altima/Maxima - Reference application guide for true fitment. For general reference only - Fits 00-01 Infiniti/Nissan - Reference application guide for true fitment. For general reference only - Fits 00-02 Infiniti/Nissan - Reference application guide for true fitment. For general reference only - Fits 03-07 Nissan Murano - Reference application guide for true fitment. For general reference only - Fits 02-06 VW Beetle/Golf/GTI/Jetta - Reference application guide for true fitment. For general reference only - Fits 05-07 Jetta - Reference application guide for true fitment. Fits 1996 to 2003 Chevrolet S-10, GMC Sonoma and Isuzu Hombre with a 2.2L engine. Fits 1995 to 2000 Toyota Tacoma with a 2.7L L4 or 3.4L V6 engine. On the 3.4L model this is the rear unit. Fits 1984-1995 Ford F-150, F-250 and 1985-1995 Bronco with 5.0L V8 gas engine.